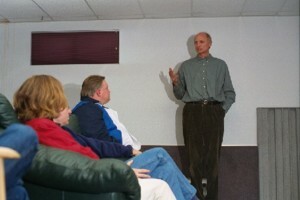 The Colorado Audio Society was founded in 1981 and has grown from 3 members to over 200 in 2013. In general terms, we are a bunch of Hi-Fi enthusiasts with particular interest in the finest musical reproduction: "High-End Audio". For some of us, that means the best for a given price range or for a given technology. Others focus on the absolute best--regardless of whether we can afford it. From our writings, you may suspect that we lean strongly to the engineering aspects of audio, but that's just who have been submitting articles of late. At this time, we are fairly evenly distributed among software oriented "Music Lovers", hardware engineering "Objectivists", and "Subjective Review" fans. Most of us are a little of each. We have in our midst tube-lovers, vinylphiles, and proponents of digital reproduction. Mostly, we congregate to talk audio and audition the broadest variety of music and equipment that we can. Our big event, held each Fall since 2004, is Rocky Mountain Audio Fest, a high-end audio show that is now widely recognized as a national exposition. RMAF is a collaboration between the CAS and a small group of CAS members. Our membership is spread along the front range of the Colorado Rockies--from Fort Collins to Pueblo and Grand Junction to the Colorado plains. To promote the exchange of ideas in audio-related topics. To provide a platform for fun and recreation of the membership. To afford the opportunity for members to listen to different types of audio equipment they wouldn't normally have the opportunity to audition. Education of the membership in order to further their individual goals in audio. To act as an instrument to unite knowledgeable minds in an effort to explore the technical frontiers of audio reproduction. To provide a forum for the exchange of ideas between audio consumers, audio dealers, and equipment manufacturers. To sustain growth and financial stability. To introduce and eventually engage the interests of the general public to the audio hobby.